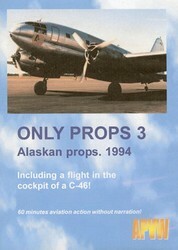 Only Props 3 - Alaskan Props 1994 is a DVD featuring several propliners filmed in Alaska. Alaska is home to an incredible number of old propliners that are still in use today as cargo planes for the transport of fuel, fish, mining equipment, and parcels. This DVD takes you to Anchorage and Kenai, Alaska, where you will see the C-46, C-97, DC-6 and more. Includes a flight in the cockpit of a C-46. Get ready for the sound and sight of props!